Is my horse sick or just unfit? Sometimes it is difficult to know whether your horse is sick or just unfit. 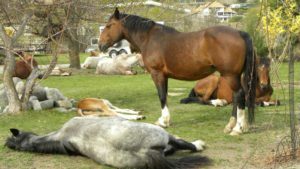 Horses who are out of work for a long period of time often look as though they are half dead when they are brought back into work. Usually, this isn’t something to worry about. Like humans – horses dread getting back into work and ten minutes around the arena can feel like a 10 km run through the desert. An overweight horse will most likely breathe more rapidly than normal but will not cough or sneeze repeatedly. He should return to normal breathing fairly quickly after stopping work. An unfit horse will ten to one be fresh and trotting on their toes with their head held high but will tire quickly. Both types of horses should improve after each ride and they should have fully recovered within a day. A sick horse will take days to recover after being worked and will show no improvement after riding numerous times. She may cough and sneeze repeatedly throughout the ride. There might be an unusual discharge coming from her nose. A vet should be called if any of the above occurs. If you are ever worried and uncertain as your horse is feeling ‘pap’ – wait an hour after riding to be sure not to get a false reading and then take your horse’s temperature.